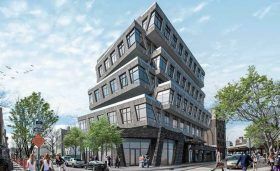 Rybak Development‘s latest venture named the Vue Condominium will add a bit of pizzazz and a sizable plaza to a popular stretch of Emmons Avenue in Sheepshead Bay. Rising from a prominent, full-block parcel at the intersection of Emmons and Sheepshead Bay Road, the envisioned eight-story structure replaces former neighborhood fixture the El Greco Diner, whose site was snapped up by Sergey Rybak and Jason Reznik for $13 million in late 2014. The project first appeared one year ago, and now a handful of renderings and a video have been released by the developers. The 175,000-square-foot structure will be the first LEED Certified building in south Brooklyn and will house 58 condos, 26,000 square feet of retail, two commercial office units, and a 134-car garage shared by tenants and businesses. 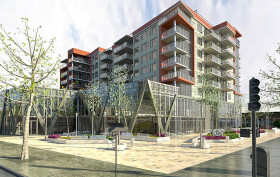 The 9,000- square-foot plaza will take up a quarter of the development site and will have raised planters, ambiance lighting and bicycle parking.